Speculo Killer. Image from Corvus Belli’s online store. The Speculo Killer is an alien from the Shasvastii race that has the inherent ability to shapeshift into any other unit from their enemies thanks to her impersonation skill. This makes her an excellent infiltrator, staying behind enemy lines until the time to strike comes, where she kills all who opose with her lethal monofilament weapon, a blade so powerful that it can cut through any piece of armor as if it was thin air, killing any target it touches. PanOceanian Fusiliear. Image from Human Sphere website. In fact, I already have that miniature, so checking for reference would be much easier. 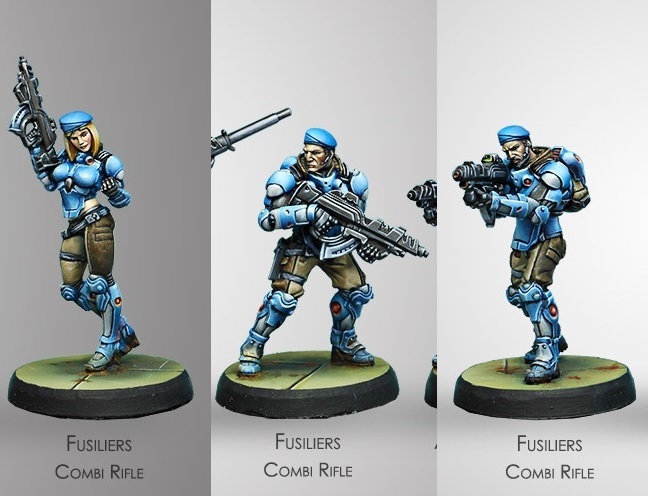 This was going to be a tough conversion, as that Fusilier belongs to one of the first (if not the first) batch of miniatures fully sculpted by 3D software, instead of traditional modelling, so I would have to work extra hard to make it look like her. Also, as this was a character to last for a campaign, I had to give her a propper name. This is how Kii-Thera came to be. I realized her back armor plate was a bit off after taking the shot, so I removed it to model it again. You’ll realize on next week’s pictures. That’s it for today’s post. Next week I’ll be showing you how this conversion ended, and also the background story I’ve written for this character.